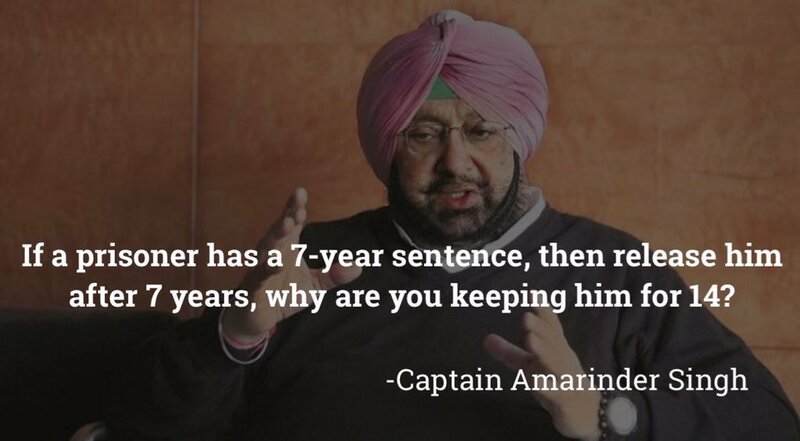 Capt Amarinder Singh on illegally detained Sikh Prisoners in Indian Jails. During the struggle for decentralization of powers for member Indian states, Punjab witnessed largest mobilization of masses in peaceful court-arrest and sit-ins (dharna’s) in 1980’s. To suppress the just aspirations of Punjabis in general and Sikhs in particular, the Union of India launched counter insurgency policies and Punjab was placed under President’s Rule. The Terrorist and Disruptive Activities Act (TADA), which has been heavily criticised by Human Rights groups gave police unprecedented power to arrest and detain individuals for up to one year without trial and judicial representation. Further, TADA shifted the burden of proof of innocence to the accused, allowed confessions obtained under torture to be used as evidence and prosecution witnesses could testify without revealing their identities to defense lawyers. TADA severely undermined the rights of the accused to fair and impartial treatment under the law by the fact that trials took years to come to fruition due to delays and deliberate inaction by authorities. Sikh political prisoners are still languishing in Indian jails who were arrested under TADA and who have lost hope in the Indian judicial system for a fair and just treatment. The Sikh political prisoners have all served their sentences and yet they continue to suffer as their appeals to be released are met with deaf ears of the law. The Government of Punjab is in unique position to show its humanity and set straight the years of abuse suffered by these Sikh prisoners, who have been so brutally incarcerated under TADA. The wheels of Justice have moved too slowly for these Sikh political prisoners, many of whom have spent additional decades in jail even though their sentence had already been served. These men have suffered enough and it is time they received humane and just treatment at the hands of both politicians and the courts. Bapu Surat Singh Khalsa has been on hunger strike since January 16th, 2015, I am appealing to the people of Punjab to join #FreeSikhPoliticalPrisoners to secure the permanent release of our brethren.